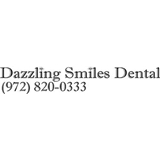 Dazzling Smiles Dental (Carrollton) - Book Appointment Online! Everybody knows good dental care is monumental in maintaining strong, healthy teeth. However, we know that a trip to the dentist’s chair can be harrowing. That’s why we do everything in our power to comfort our patients when they’re with us. At Dazzling Smiles Dental, we offer personal, professional dentistry in a warm, friendly setting. Visit us for all of your family’s dental care needs.